GOLD to go is the world’s first vending machine that distributes gold. The first one has been installed in Abu Dhabi and there are now others around the world, with plans to bring them to the US as well. The GOLD to go vending machine is an unmanned point of sale. 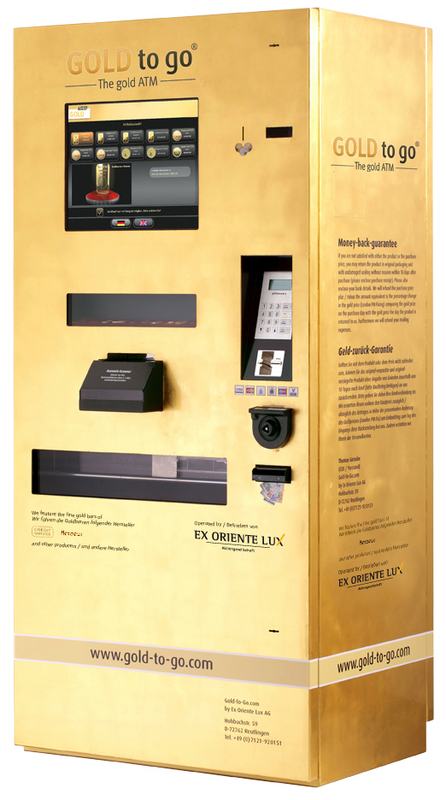 It offers an extraordinary opportunity to purchase gold bars and coins of assured quality, backed by the security of a Swabian Fort Knox® and with the ease-of-use of a vending machine. Prices are updated in real-time. The GOLD to go gold vending machine is largely burglar-proof and tamper-resistant. It has an excellent user guidance, which makes it very easy to handle.